Essential Safety Measures (ESM’s) are vital for the life, safety and health of people over a building’s duration. It’s important for the owner of the building to be informed of their obligations regarding maintenance of the ESM’s in their buildings. The type of maintenance required depends on the complexity of the safety measure and will differ depending on the use and type of building. that there is some protection against litigation and potential insurance claims. The greatest concern for building owners is the risk of failure of an item when it is needed in an emergency situation. In Part 12 under the Building Regulations 2006, essential safety measures are defined as the fire, life, safety and health items installed or constructed in a building or place of public entertainment, to provide for the safety of people. Mechanical ventilation & hot, warm & cooling tower water systems. What Types of Buildings Require Essential Safety Measures Maintenance? All buildings, other than a house or outbuilding, are affected. These include the following Classes as defined in the National Construction Code Series. Class 9: public buildings such as healthcare buildings or assembly buildings, schools, churches, night clubs etc. As The Owner Of The Building, What Do I Need To Do? Under Building Regulations 2006, as the owner of a building, you are responsible for the ongoing maintenance of the essential safety measures of the building to ensure they function properly and fulfil their purpose. The owner is also required to provide an Annual Essential Safety Measures report and statement, indicating that the essential safety measures have been maintained and that appropriate records of maintenance, service and repair work are kept. We have created an Essential Safety Measures Program to help building owners with their essential safety measures obligations. We know the issues that may arise and can guide you through the process. Our focus is on personal delivery and service. We have partnered with Sterling Fire Services to provide our clients with a reliable maintenance service, meeting the requirements of AS 1851. Technicians are trained to identify non-compliance items and are experienced in maintaining and servicing essential safety measures. Our team can offer a fully managed and comprehensive program throughout the year, based on the services you require. We have developed a simple 5-step process. There are different requirements under Part 12 of the Regulations, depending on when the building was built or when subsequent work took place. Buildings constructed before 1994 have no specific schedule of essential safety measures. You are, however, still responsible for ensuring that all safety equipment, safety fittings or safety measures are maintained and fulfilling their purpose. These include exits and paths of travel to exits. You are required to prepare an Annual Essential Safety Measures report (AESMR). It’s recommended to keep records of all maintenance checks, safety measures and repair work. These documents must be made available to the Municipal Building Surveyor or Chief Officer of the fire brigade within 24 hours of any notification. Maintenance records can be in the form of maintenance record tags or log books. However, the use of tags or labels shall not preclude the need for a separate maintenance record system. If you undertake any building work on the building, these circumstances may change, so you should check with a building surveyor to see what is required in order to comply. For these buildings, the list of essential safety measures, including their performance level, frequency and type of maintenance required would be included with your occupancy permit or certificate of final inspection. You are required to prepare an Annual Essential Safety Measures report. For owners of Class 9 buildings, and Class 2 to 8 buildings constructed or altered since 1 July 1994, must have a current copy of the building’s occupancy permit on display in the building. All reports and records of maintenance checks, safety measures and repair work are to be kept on the premises for inspection and must be made available for inspection within 24 hours of notification. There are penalties for non-compliance which may involve the issuing of a Building Notice against the property. Alternatively, fines may be applicable for individuals or companies for every breach of the Regulations. In some cases, owners have been prosecuted in court proceedings for non-compliance and have been caused to evacuate the building until such time as their essential safety measures compliance requirements have been satisfactorily met. 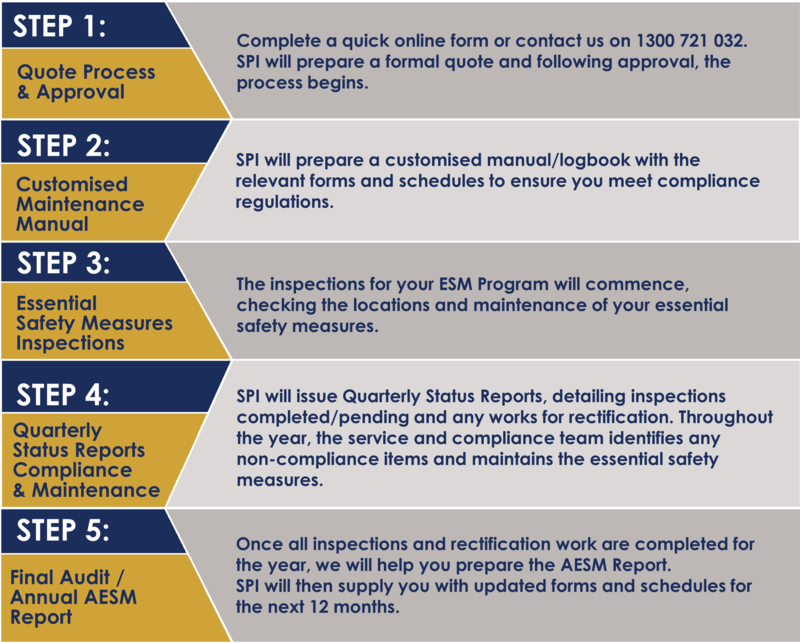 The SPI system is designed to help building owners with their essential safety measures obligations. We know the issues that may arise and can guide you through the process. Ensure you meet your compliance obligations. Contact SPI Property Inspections for a quick free quote or phone us directly on 1300 721 032.